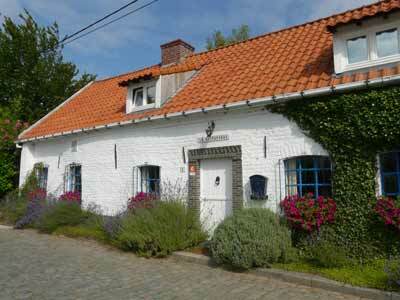 The cottage is located on one of the most beautiful green hills of the Flemish Ardennes. 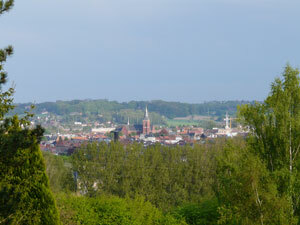 The view over the city of Ronse and the surrounding hills is splendid. Here you can enjoy a calm and quiet surrounding without being isolated. The location of the cottage is great to plan visits to beautiful cities like Bruges, Ghent, Antwerp, Brussels, Oudenarde, Tournai and Lilles. Even Paris is only 2.5 hours from here. Bikers can have lots of fun cycling the Tour of Flanders and other famous routes. Nearby there is the lovely chapel of Wittentak, that was elected as the most beautiful nature spot in Ronse. In walking distance you can find the mill of Hotond, the highest spot of Flanders. From there you can enjoy a marvellous view from Ghent to Tournai. There are several walking paths and mountain bike routes passing in front of the door, as well as a GR-route (Grande Randonnée = Long Distance Route) nearby. The name of our cottage means in Spanish:' She who takes the sorrows away'. We invite you to come and taste the wonderful and authentic energy of this more than 200 years old farmhouse. Children love it and call it the "Dwarfs' house".